Bart Blaze Tweeted me a malicious Word document sample (MD5 23a2d596d927ceab01918cc1dfd5db68) that can not be analyzed with my oledump tool. It turns out to be a MIME file that contains a MSO file, that in turn contains an OLE file. We've seen MSO files containing OLE files when we talked about XML Office documents. I've updated my oledump tool (V0.0.15) to handle MSO files directly. Bart has a blogpost explaining several methods to analyze this file. If you want to use oledump, first you extract the MSO file from the MIME file, and then you use oledump. 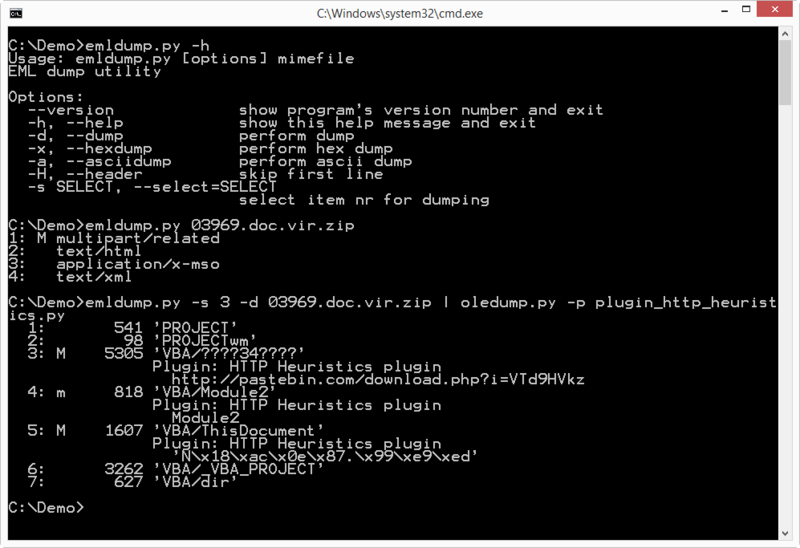 If you don't have a tool to handle MIME files, I have one: emldump.py.